Can I Use BabyDam At Either End of The Bath? Armed with a newborn and being a first time mum is probably one of the most daunting, exciting and scary feelings of all, the emotions you experience are overwhelming and can wash over you in waves. No books, words of advice or videos can prepare you for it, and it’s not until they’re here in your arms that the learning process really starts, and that’s what it’s all about. None of us know how to do things perfectly or what to expect and that’s OK! So, when it comes to bathing your newborn for the first time or perhaps you’re looking for new items to incorporate into the baby bathing routine, we’ve put together a baby bathing checklist – lots of essentials and also little extras that might help make that bathing experience for the both of you that little bit easier when you’re getting them warm and snuggly after bath time. Baby Bath/BabyDam Bathwater Barrier/ Bath Support (all optional and down to your preference) – it’s important to consider what would work best for you and baby, whilst a traditional baby bath is perfect for the early days, depending on growth and development, after 6-10 months they’ll have to graduate to the big bath. A BabyDam can be used from the outset with a newborn and the size of the bath can be increased with it as they grow accordingly. Unlike a bulky bath, it can easily be stored and transported in an overnight bag for holidays so bathing a baby when you’re away doesn’t have to be a stressful experience. Soft flannels or a soft sponge / cotton wool – When they are in the early newborn stages you might choose to top and tail baby a few times a week, as their skin is very sensitive and delicate at this time they don’t need to be bathed daily. Soft flannels or a soft sponge are perfect for delicately cleaning babies skin, ensure they’re washed after every use. Baby soap and shampoo – a gentle baby soap and shampoo is all you need when they’re little to avoid skin sensitivities. Ensure it’s approved for babies and it’s fragrance free. Bath thermometer – an optional extra, a bath thermometer will give you that peace of mind that the bath water is at the perfect temperature for your little one. Tap cover – This will become a godsend as little one starts to become curious at bath time, we know how much of an attraction those pesky taps can be for little fingers! A tap cover will protect little one from bumps and bruises. 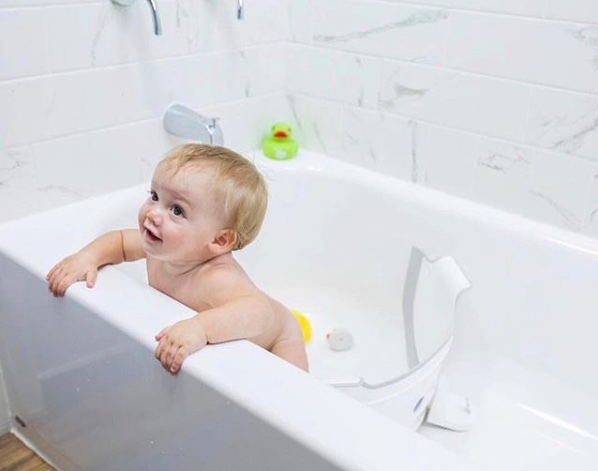 If you use a BabyDam you have the option to fit it at the other end of the bath and fill with a shower head so this eliminates the issue of them being close to the taps end of the bath. Rinsing cup – no more tears! A must have when they get a little older, anything to make bath time that little bit more stress free is worth it in our opinion! Soft hooded baby towels – once bath time is over it’s a rush to get your little one dry and changed as their body temperature quickly drops. A super soft, snuggly and hooded towel will get them into your arms and changed as quick as possible. Bath ducks – as they become more interested in bath time, introducing some bath toys will ensure that every bath time is a fun bath time. We can’t promise they’ll want to get out though! Spare towels – prepare for plenty of splashing, but hopefully not getting soaked! Having spare towels on hand to mop up spillages and splashes will keep everyone happy at bath time. What are your top 5 baby bathing essentials? Is there anything we’ve missed off our list? Keep up to date with the latest news from BabyDam over on our Facebook page, Instagram or Twitter!